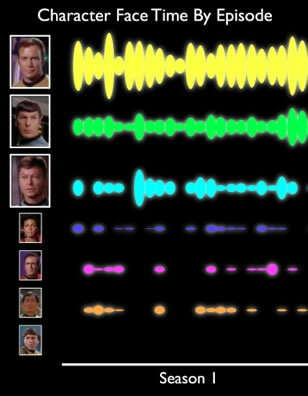 "Here's a pretty neat read-out from the Pittsburgh Pattern Recognition sytem - Star Trek character face time by episode over the course of an entire season. I find myself wondering what a similar display would look like, showing your habits of hanging out at local coffee shops, convenience stores, malls, street corners, etc." "All this tech needs to do is tap into the web for data to match up faces with. Facebook and MySpace will become the highest visited places." "The end of privacy as we know it. We will all have to start wearing masks where ever we go." "Joey, you're right. Profile information is probably the best place, followed by names that are closely associated with pictures. See also the Polar Rose face search idea; it asks for help from people."